Firestiks are pretty ... even after peeling off their skin! 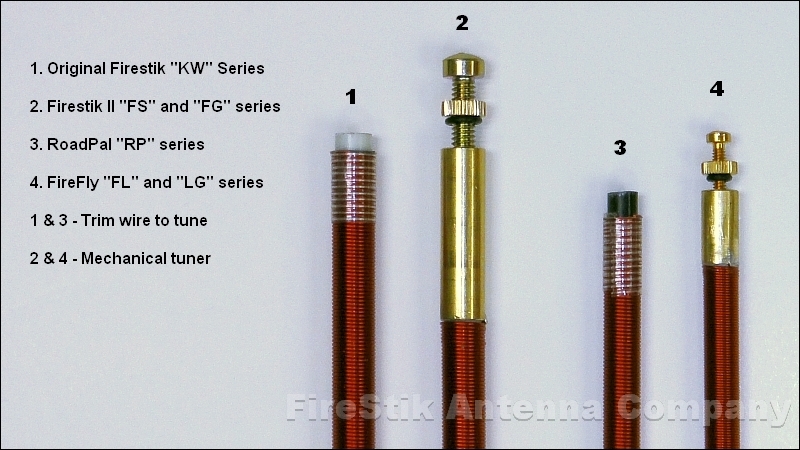 A look at the Firestik brand antennas before they get their colors. All antennas used on radios that transmit MUST be tuned after installation. The vinyl antenna tip MUST be installed during all testing. If you tune the antenna with the tip off and then put it on afterwards, the antenna WILL look electrically long (SWR higher on CH40 than CH1). Top loaded antennas are extremely efficient radiators, adding the tip alters the way the electromagnetic field leaves the antenna (capacitance) and that is why it must be on while testing. The tip is optional, but if you tune the antenna with the tip on .. taking it off will change its operational center frequency. When removing the tip, never use a twisting motion ... ALWAYS pull the tip straight off (either grasp it on two sides with your fingernails or place it on the edge of a bench or angle iron at about a 45 degree angle and pull striaght back on the antenna). It helps to rub your forehead and get some body oil on your fingers that you can rub on the top of the antenna to help with its installation and removal during the tuning process. Once the antenna is tuned, remove the cap one more time, spray a little hair spray on the top and immediately install the tip. The "sticky" will help the tip stay in place if it comes in contact with a tree branch. The "KW" and "RP" series, trim to tune antennas are intentionally made on the electrically long side (favor lower channels) so they are well suited to installations with less than optimal counterpoise (ground-plane). On vehicles with marginal metal that the antenna can use as the needed reflective element, having additional wire will offer a degree of compensation. There is, however, a point where the vehicle fails to supply enough ground-plane for even one of these antennas (fiberglass motorhomes and vehicles, motorcycles, some ATV's and UTV's, etc.). In such instances, the only remaining choice is a no-ground-plane (dependent) antenna system that is comprised of a special antenna and matching coaxial cable. A common mistake made by the "newbies" is to see the tunable tip antennas and think that the "KW" and/or "RP" antennas, because they do not have a tunable tip, do not require tuning. Wrong! All antennas that are used on radios with the capacity to transmit a radio frequency must be tuned after they are installed. Failure to do so could cause damage to the radio. The mechanical, tunable tip antennas, "FS", "FG", "FL" and "LG" series, make the process of tuning the antenna much easier. When they are assembled at the factory a tool is used to install the tuning screw assembly so they are "bottomed out" against the tuning extender. Before installing and testing the antenna, the tuning screw should be raised about half way up and locked down for initial testing. These antennas are designed using many decades of know-how and the mid-way point is a good place to start all testing and tuning.